This is a summary for Brinley from 15.5-16 months old. table with the picnic set. Brinley moved to one nap a day even on Sundays. She is quite flexible, so on Sunday we can put her down two hours early and she still takes a good nap. I don’t know if that is because she is still young for one nap or if it is just how flexible she is. Time will tell. My best guess is it is her age. She definitely is a flexible person–she has been great through disruptions over the holiday season. So she definitely has flexibility going for her, but going down for a nap two hours early is pretty odd for a baby, so I am guessing it is mostly that she is young enough she can be tired enough for a nap at that point and partially that she is also flexible. Remember how I was wondering how the whole Christmas tree thing would go? She has been awesome! She started by touching, then moved to just looking, and now she doesn’t even seem to be tempted by it. She only took one day of reminders to get to be consistent enough I trusted her by the tree. Brinley got another cold during this period. Sicknesses are so annoying! And I don’t think she is sick that often, but it seems like every summary lately has had a section on her having a cold or some other sickness. Does Brinley really get to sleep til 4:00 everyday? I put my daughter down at 12:30 because by 3:00 she has to be up so I can pick up her brother from school. Although, at least half the time she only sleeps 1.5 hours anyway, sigh. Also, am I reading that right that you do 1 hour independent playtime? I'm looking to increase my daughter's, I think. She does 35 minutes now. She's about 2 weeks younger than Brinley. 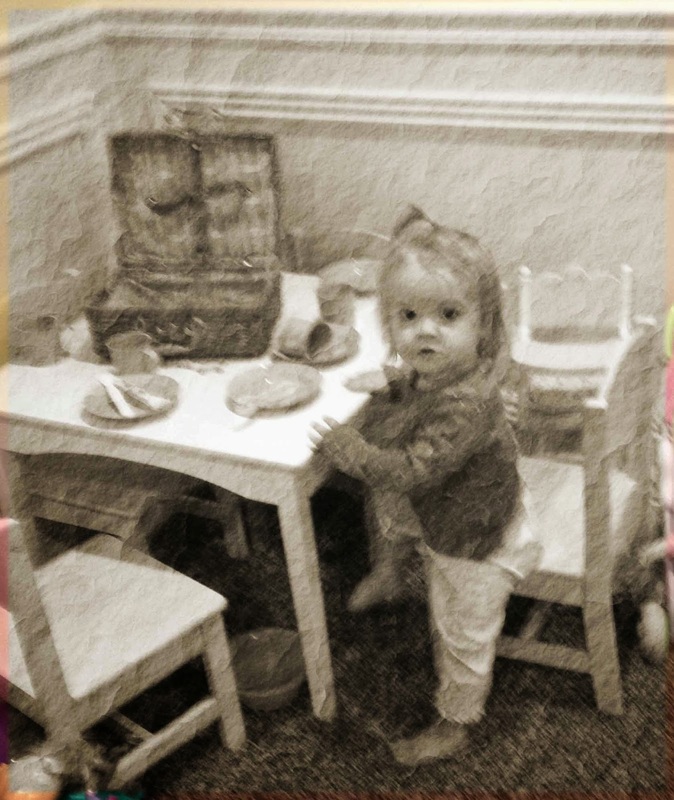 May I ask what is the brand of the table and chairs that Brinley is sitting at in your picture? Would you recommend it for other toddlers? Stephanie,Yes, my kids ride the bus home. And yes, one hour of independent play. Do you have a neighbor who could sit at your house while you pick up kids? Or a neighbor you can carpool with? Helena it is by KidKraft and yes! We have loved it. It has held up well for many years with lots of use and being moved around by my kids. They love having a table their size.